Saint Paul the Apostle Orthodox Church - May A Christian Grieve? "Do not weep for your loved ones. They are with Jesus. Ours are only tears of selfishness; we weep only for ourselves. We should be happy that those we love have died and gone home to be with God." That is what was heard in a recent homily preached at a funeral. No doubt just about everyone has heard such exhortations. The statement implies that grief is an inappropriate sentiment for believers, that our faith eliminates the need or legitimate right to grieve. How many times have we heard someone at a funeral praised when they showed no visible signs of grief, no tears, no sadness, no cries of lamentation. "They are showing such faith" we sometimes say. Just about any priest can tell you about being called into a hospital room by a nurse when one of her patients dies. "The family is there and they are all crying. Come say something that will get them to stop crying and make them feel better." Behind all this, is the assumption that grief is an un-Christian or sub-Christian response to the death of a loved one, that we who believe, have discovered some sacred truth which makes grief obsolete, that the Christian hope in eternal life eliminates grieving over those who die. What is a proper Christian response to death? Or to put it simply, can an Orthodox believer grieve? The spiritual importance of grieving has been well documented in recent years. The death of a loved one provokes an identity crisis in us. We are suddenly thrust from marriage into singlehood, from having a parent to have no parent, from having a friend to being alone. Grief involves complex emotional factors which are all related to the crisis of bereavement. We grieve because of self-pity, "What will become of me now that he's gone?" Or anger, "After all I've done for her during her illness, how could she just leave me?" Or guilt, "If I had only known, I would have " Or simply. because we will miss the departed individual. "How am I ever going to get along without you?" or a variety of other feelings which the loss of someone we love evokes in us. All these emotions are important and permissible. It is pointless and even harmful to argue that one should not feel anger or guilt, or self pity or a sense of loss. The feelings, even some very negative feelings must be accepted, expressed, and worked through before healing can begin. In one parish, two women who lived on the same street lost their husbands within three months of each other. One woman, in the words of the community, "took it hard." She showed much grief at the funeral. As their pastor found in a conversation with her after the funeral, some of her grief was related to the fact that she had been totally dependent on her husband. Now that he died, she wondered if she would be able to survive and live. She was able to express these feelings, and soon she was able to do something about them. She got financial counseling from an accountant. She learned how to manage her household by herself, and got a part-time job. She recovered from her grief in a relatively short time. Her neighbor down the street did not fare so well. When her husband died, she was a model of composure, balance and strength. Her doctor gave her a sedative to help calm her. She presented the appearance of a person who was "taking it very well." But not too long after the funeral, the pastor of the parish noticed troubling signs in her behavior. She stopped coming to church. She dropped out of all her old activities and became a virtual recluse. Conversations with her convinced those around her that she was not yet fully honest about her grief. "I'm doing fine," she always curtly said. It was suspected she felt remorse and anger that her husband had been taken from her so unexpectedly, leaving her to raise their young children all alone. But rather than submit to her feelings and accept them realistically, she suppressed them and became more and more depressed. Both priest and therapists speak of "grief work" and it literally is work. Grief is a process of working out and living through some very painful feelings, coming to some tough decisions, and performing some difficult actions. But it must be done. Suppressing grief is tragic. When we drug or rationalize our feelings away, or cover our pain with a sugar coating or religious platitudes, we fail to face up to something that must be faced. Namely, someone we love has died and is now- gone from us. We are going to feel` the pain of their absence and we are going to miss their presence. Our life is going to be affected by their absence. The funeral as we know it in our Orthodox Church is vitally important as a communal, supportive, spiritually comforting, patterned way of working through our grief. The hymnology points out a great deal of reality. The more elaborate and profound the funeral practices are, the more elaborate the burial traditions, the more care the Church gives to its ritual related to death, the more quickly and effectively grief is worked through. At a time when many churches mistakenly de-emphasize the funeral as a kind of morbid vestige from a pagan past, priests and therapists are increasingly noticing the therapeutic value of funerals for believers, coupled with other meaningful rituals that are related to the grief process. In our Church we do not forget the departed soul, but continue to pray for it, entrusting it to the merciful care of God in the Divine Liturgies and anniversary services as we continue to celebrate its memory. The Saturdays of the Great Fast are dedicated to departed souls and commending the care of our beloved departed souls to God on a continuing basis has a sound grief resolution inherent in it. We remember them on their birthday, on the anniversary of their death, on the Fortieth day after they have been called to eternity. We even visit the cemetery and conduct commemorations there at the grave site. The theology of our blessed Church even teaches us the departed continue to participate with us in the glorification of our God. Our worship includes the souls of those who have seen called to their eternal reward. We do not feel the drastic separation in death that so many others are forced to endure. We easily admit the psychological and spiritual importance of grief as a necessary part of accepting death. But are these psychological aspects of grief simply expressions of the general weakness of human nature? Might it still be argued, from a Christian perspective, that while grief and expressions of grief are understandable, tears and mourning are inappropriate given the Christian understanding of death and eternal life? 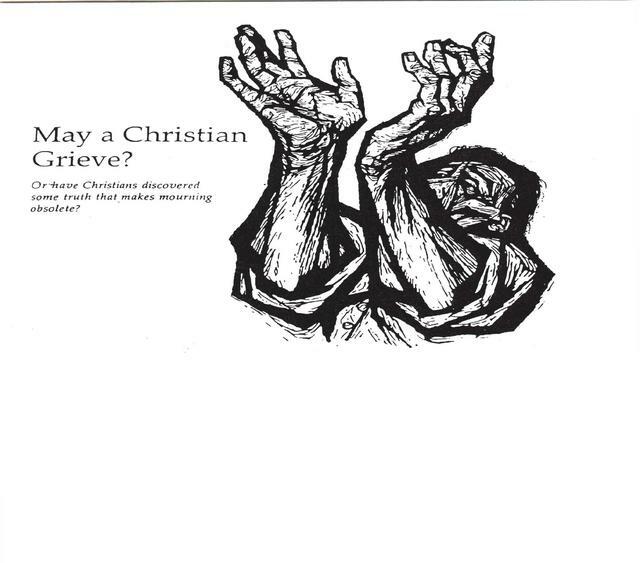 Or to ask the question again, can a Christian grieve? Finding the Christian response to death is not quite as simple as some would have us believe, especially if we start by examining the question in light of Scripture. We might begin by looking at one death which should be central to the Christian's understanding of death - the death of Christ, "the first fruits of those who had fallen asleep" 1 Corinthians 15: 20. The gospel accounts of Jesus' death show three different aspects of His last moments on the Cross. SS. Matthew and Mark show Jesus quoting the Psalmist's cry of dereliction: "My God, my God, why have you forsaken me?" Matthew 27: 46; Mark 15: 34; Psalms 22: 1. But St. Luke shows Jesus repeating the same prayer that every pious Jew recited at the close of the day: "Father into Your hands I commend My -spirit" Luke 23: 46. St. John shows Jesus uttering a cry of final triumph, "It is finished" John 19: 30. If Jesus is the model for Christian dying, then on the basis of these texts from the gospels we could assume there is no generally uniform response from either the dying or the bereaved Christian. The New Testament writers present us with different responses to death because we are all different and react differently to it because of who we are as individuals and because of the relationship we have with the departed. Then, there must seriously be considered the relationship we have with Christ by the grace of the Holy Spirit. In St. John's gospel, Jesus' death is His glorification: -"And lo, when I am lifted up from the earth, will draw all men to myself" John 12: 32. This evangelist uses "lift up" in a double sense of being lifted up on the Cross to die and being exalted in heavenly glory. This triumphalistic understanding of Jesus' death is in keeping with St. John's lofty, "It is finished" and is the tradition of the Orthodox Christian Church where in times past instead of the identifying inscription on the Cross containing the name of Christ, instead announces, "King of Glory" because it is through death that Christ accomplishes the purpose of His coming among us in the flesh. St. Paul offers us another perspective, "Christ died for our sins in accordance with the Scriptures ... he was buried ... he was raised on the third day in accordance with the Scriptures" 1 Corinthians 15: 3, 4. He does not want his readers to see Christ's death as identical with His Resurrection. He continues this line of thinking when he admonishes those at Corinth who have gotten the idea that, since Christ is risen, and we somehow also participate in the resurrection, there is now nothing else to look forward to. They seem to feel that there is no coming Resurrection, since from their point of view, "the resurrection is already past," 2 Timothy 2: 18. St. Paul rejects this thinking. He stresses the seriousness of death, which some of the Corinthians evidently regard as little more than a passage to a fuller enjoyment of the mystical delights which they already possess through Christ's exalted Resurrection. St. Paul opposes the notion that everything has been accomplished because there is still our personal participation in it. "Not that I have already obtained this (the resurrection from the dead) or am already perfect; but I press on to make it my own, because Jesus Christ has made me his own" Philippians 3: 12. "The creation waits with eager longing for the revealing of the sons of God. We know that the whole creation has been groaning in travail together until now" Romans 8: 19, 22. Sin and death, the hard facts of present existence, remind us 'that we are still living in the midst of a world awaiting completion of final redemption. St. Mark's gospel underscores this theme. Christ's Resurrection is not total fulfillment which makes all expectation for future deliverance illusory. In Mark's gospel the Resurrection of Christ is underplayed. Mark recounts no resurrection appearances to the disciples, and in Jesus' final discourse (Mark 13) He does not even mention the Resurrection. The climax comes in the prediction of His return: "And then they will see the Son of Man coming in clouds with great power and glory" Mark 13: 26. All this merely shows that the Christian attitude toward death is complex because it is related to several affirmations of Christian faith. While the New Testament does affirm the necessity of passing through physical death to obtain eternal life, it does not abandon the Old Testament view that death is something unnatural, something contrary to God's original intention and literally then, the enemy of man because it is the result of our sin. (Genesis 3: 17 - 19). This is why the Christian's attitude toward death and his response to bereavement is inevitably ambivalent many times even though it should be triumphant and victorious. The death of Jesus represents our liberation, but it is also cause for lamentation because He is thereby removed from us. "The days will come, when the bridegroom is taken away from them, and then they will fast in that day" Mark 2: 20. At the death of the first Christian martyr, "Devout men buried Stephen, and made great lamentations over him" Acts of the Apostles 8: 2. After the death of Tabitha, "All the widows stood beside him (Peter) weeping" Acts of the Apostles 9: 39. As long as the story of God's dealing with us remains unfinished, death cannot be regarded as an unmitigated blessing. It is separation, and separation is painful. Therefore, like the early Christians before us, we also grieve. Lately, some have come to the erroneous conclusion that death should not be an occasion for grief. Some think death should be viewed as something natural and acceptable. Orthodox Christians know death is not acceptable even though inevitable. Amid Resurrection celebration, there is a definite place for tears and sorrow. While we cannot advise a joyous funeral, our living ought to point in that direction even though human reality will be pained and afflicted with our loss in death. While it is true we should look at death in view of Christ's triumph, as a process we rejoice in rather than mourn over, the human response to death is more complex than a simple smiling affirmation of the glory of the afterlife. Perhaps some of the current emphasis on joyful funerals and death without grief is just one more attempt on our part to escape the reality of death. We are usually masters at rationalizing and avoiding things which threaten us. When death takes someone we love, it is tempting to try to avoid the pain of loss by saying, "He is better off, " or, "She is with Jesus now; there is no need to be sad." But is this not dishonest about the pain of separation and the dark mystery of death? It will be a tragedy indeed if we transform our funerals from important occasions when the community of faith meets to support a grieving family and affirm basic beliefs about death and life, into hypocritical illusions which urge people to suppress their real feelings and avoid the pain of death. There are many ways to grieve. Some may show grief through anger, or shouts of despair, or tears. Some may grieve in `quiet, hurt, introspective solitude. The point is the Christian community and its ritual response to death must give each bereaved person the grace to grieve in his or her own 'unique way. The bereft person who strolls out of the funeral home simply with an indifferent smile pasted on his face, saying "it doesn't really hurt at all," could be heading for serious psychological and spiritual disaster. Such an attitude can inflict deep wounds that fester rather than heal. Indeed to lack some feeling of grief at the time of death would be to lack love itself. Love binds us to other people. When death comes those bonds are severed, at least in a temporal, physical bodily sense. In a time of such separation, grief is evidence of love, itself a divine gift. Sometimes as we fight back the tears and heroically suppress our feelings of grief, in the name of our Christian faith, it is almost as if we are trying to be more Christian than Christ Himself! For we must be reminded that Jesus is recorded as having wept on two occasions. He looked out over his beloved city, Jerusalem, and poured out tears of grief because she had denied her destiny. His grief was an expression of His love and His disappointment at the coming tragedy for the people He so loved. Jesus wept at the thought of the unrealized dreams and the unfulfilled hopes which the eventual destruction of Jerusalem would mean Luke 19: 41 - 44. Jesus also wept when He visited Martha and Mary after the death of Lazarus. Those who stood near Him on that day were quick to interpret His behavior, for they said, "See how he loved him" John 11: 35, 36! Grief was rightly seen as an expression of love. Some deaths, for instance, those which mark the end of a long and terrible illness, can truly be a blessing. And some deaths, when one has lived a long and productive life as a committed believer in Christ, can truly be spoken of in terms of joy and triumph. But few deaths are without their corresponding sense of separation, loss, bereavement and grief because they leave behind human souls who are imperfect and who keenly feel the loss. The older funeral rites, which emphasized the somber aspect of death, were not without their scriptural justification, but they simply omitted the triumph of Christ over death. Rather than show some simplistic contemporary notion of death, our funeral rites must reveal the full character of the Christian response to death and bereavement as we see it expressed in Scripture and the Tradition of our Church. Christians must be encouraged to be honest in their expression of grief and in their feelings when a loved one dies. These feelings should be expressed and accepted rather than argued away with Scripture quotes or rigid principles of what Christian grief ought to look like. Many parishes have set up grief recovery groups for those who are grieving. These small groups provide much needed support, sharing, and an honest, open and caring environment for the difficult and sometimes lengthy grief process. In summary, we need to give more attention in our churches to the importance and difficulty of grief by inviting those who suffer with grief to participate fully in the restorative process of prayers for departed souls at the appropriate times. This in itself shows God is interested and concerned with our grief. Christians should not be expected to suppress their sorrow over the loss of their loved ones. Christians grieve at death as does everyone else. But because of their faith in the ultimate goodness and continual triumphal love of God through Christ, they do not "grieve as others who do not have hope" 1 Thessalonians 4: 23. We have a firm, sure hope, but our hope does not make grief improper. In the face of death, Christians respond with both grief and hope, in the wholeness of living faith. When Jesus wept at the tomb of Lazarus those near him were quick to interpret his behavior: "See how he loved him."